India is a bit of an anomaly on the world stage. It's a massive 1.2 billion person strong country stretching thousands of miles tall and thousands of miles wide with one of the most sizable economies in the world, but it was never really destined to be a country� at least not in its current form. To the north-east the country is shielded by the formidable Himalayas. This mountain range is nearly impenetrable even for a modern army. China and India have fought a few small skirmishes over border disputes in the region, but a full-scale land invasion from either across the Himalayas would be difficult. China has control over Tibet�a vast region lacking the infrastructure necessary for quick troop movement�while India remains politically close with Bhutan and Nepal�two nations sandwiched between India and China. Largely because of this enormous mountain range, India historically has not had many relations with China�the other superpower of the region. Contact between the two countries today remains cold due to their border disputes. Both countries claim this entire area and every few years the dispute escalates�a dangerous situation between two nuclear powers. You can't even drive from India to China due to this�there are no border crossings between them�but for most there's little reason to cross the border as the two countries are vastly different culturally. As mentioned, due to the mountain range they didn't have much contact historically so they each developed into what they are today independently. India's longest border is with the ocean. Ocean borders are a bit of a double edged sword. The ocean allows civilizations like India fairly simple access to the world, but it also isolates. Some countries, like the UK, used oceans both to grow their global power while also benefiting from the relative protection they give. Any military invading by water is at a significant disadvantage to those defending so ocean borders were and still are a source of geographical protection. India is also relatively isolated in distance to other powerful countries so a defensive navy was never really necessary because the country was never significantly threatened by sea. By water, they're over 800 miles to the Persian Gulf, about a two day boat journey, over 1,700 miles to Singapore, a four day boat journey, and nearly 3,500 miles to Hong Kong, over a week's boat journey. In fact, by boat, they're really just as close to the significant cities of eastern Asia as Perth, Australia. Many of the other powerful countries of the world developed into what they are today because of their proximity to other centers of power. In Europe, if Portugal invented something it would quickly spread to Spain, France, Germany, Denmark, Sweden, and all the other nearby countries while India had to go through its whole process of technological and cultural innovation largely independently. India did have navies through history, but they were never world-class and they never used them to conquer lands far away. It was never their priority as the leaders had their hands full already keeping their massive territory together. They also didn't have the need to colonize far-away lands as India itself really had all the resources they needed. The UK, France, and Spain colonized partially because they had large, developed populations within small areas lacking enough natural resources to advance their country's power. India was a highly developed and powerful country historically and it just didn't have the need to go outside its region. This is part of the reason why India is so culturally unique but it also may have put them at a disadvantage through their historical development as they were not exposed to some of the technological advancements of other civilizations far away. India's north-west border is really the problematic one. 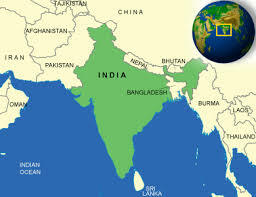 Back in the 19th and early 20th century, India was ruled as a colony of the British Empire, but before the British came, India was not truly a country but rather a loose collective of regional powers. For example, in the 16th century someone from Bahmani would have never called themselves Indian�they were Bahmani. With the British, this entire area was brought under the rule of one central government that reported to the British crown. This entire area, with nearly a thousand different languages, hundreds of different ethnic groups, and six different major religions was grouped into the one crown colony. Unsurprisingly, the British rule didn't last for long. After World War Two, the nearly bankrupt crown folded to pressure and decided to give up the now unprofitable territory, but the way they went about leaving the sub-continent has had far-reaching consequences. Many of those in charge of the transition were followers of a theory that stated that the diverse people of India were singularly differentiated by their religion�not their ethnicity, language, or any other commonality. The idea was that within India there were two nations in the same territory� the Hindu one and the Muslim one. So, in what they believed was a step that would reduce violence, those in power split the country into two�India and Pakistan. The idea was that Pakistan would be the country for Muslims, while India would be the country for Hindus. Over the months following the partition, tens of millions of people crossed the border to settle in the country for their religion and in the ensuing violence up to a million people died. This whole plan was destined to fail. Pakistan was given land with few resources and it was a country split in two. East Pakistan was separated from the capital in West Pakistan by nearly 1,000 miles of hostile territory. To think that the two parts could exist as one country would be absurd and, unsurprisingly, east Pakistan eventually revolted and became an independent Bangladesh in 1971. India and Pakistan have been at odds almost continuously since their partition. They have fought countless times and it's now almost engrained in culture for Indians to hate Pakistanis and vice versa. This is far from surprising given that the two countries were created through concentrating the two groups that were already at odds, but from an Indian perspective, the border with Pakistan is a problem because it just looks like this. It's open, flat, and relatively sparsely populated compared to the Pakistani side largely because of this�the Thar desert. The Thar desert pretty much ends right at the border with Pakistan which means it's easy for Pakistan to build up their military infrastructure at the border while it's hard for India. If Pakistan invades India they would have to cross this desert which would be difficult, but overall Pakistan has a greater advantage by having a populated and inhabitable area on their side of the border. This border is India's greatest geographic weakness and it has helped fuel the ongoing conflict. If there were a significant river or mountain range or something in between these two countries, they might have been able to coexist, but as of now, the India-Pakistan conflict seems almost endless. As the two largest countries in the world and neighbors, India is most commonly compared to China. In 1980 the two countries had nearly identical GDP's and over the past 50 years their populations have grown at similar tremendous paces, but China has now taken the lead as the more developed country with a GDP five times greater. But India's economy is now growing even faster than China's. They're benefiting hugely from one of the greatest trends in business�outsourcing. Believe it or not, this success can even too be loosely linked back to geography. The British came to India because of all the natural resources it had, but their presence back then is part of the reason why the economy is growing so fast today. There's no doubt that the British empire did a lot of bad to the country that has caused huge economic damage, but during their reign English literacy got good and the country continues to excel in the English language today. In fact, India is second only to the US in number of English speakers at 125 million. Of course due to their enormous population this is only 12% of their people, but businesses worldwide saw the opportunity presented by a cheap labor market with such good English literacy. The first wave of outsourcing came as businesses moved their accounting, human resource, and customer support operations to India, but today India is benefiting from something different. India has become a major destination of software development outsourcing as Indian developers can do much of the work for a fraction of the cost of western workers. The reason India is able to serve this industry is because the country has a lot of educated people, but it also has a lot of uneducated people. India produces tons of really smart people, but their educational system also lets many others fall through the cracks. It's an unequal system but it means that the country has a big subset of its population that's educated enough to work medium-skilled jobs in English. This is unlike China which has a perhaps more equal system that produces a huge population educated enough to work low to medium skilled manufacturing jobs. Part of the reason India's educational system might be like this is because the country has a lot of isolated rural areas. Transportation is very hard in this country due to hostile terrain, lack of infrastructure, and a hugely dispersed population. In fact, the entire country historically was pretty much split into two by this hilly region halfway down the sub-continent. China, on the other hand, benefits from a much more urbanized population which makes it easier to set up a smaller number of better schools concentrated in large cities. The urbanization level of a country actually correlates very strongly with the quality of their educational system. All the least urbanized countries like Chad, Afghanistan, and Burundi also have some of the lowest ranked education systems. Of course correlation does not equal causation since as a country develops economically it tends to urbanize, but it's doubtless that it's easier to educate a population that's concentrated into large cities than spread out. Even the US hasn't fully solved the problem of how to educate a spread-out rural population and there's a huge disparity in quality of education between big cities and small towns in America. Overall, in India, there are some great schools in the cities, but the rural population is often left behind with sub-par education. India is the country it is today because of its geography. It inhabits an amazingly diverse and resource rich area that has successfully been able to serve as home to well over a billion people. The sub-continent developed into such a diverse area because it's always been hard to get around due to natural barriers and size. When the British came they tried to integrate all the different nations into one country by building up railway and road infrastructure, but still today India is a country of nations. Much like the US they've created a federalized government with different states each with a level of autonomy acknowledging that a one-size-fits-all governance system cannot work with so many people with different ideals, issues, and wishes. The country benefits hugely by having a favorable geography for agriculture which has allowed it to grow into the second most populous in the world. Economically, its numbers are its assets. With so many people, there has to be a good amount of highly educated people who can drive innovation, serve as a workforce, and raise the development level for the entire country. As one of the fastest growing economies in the world, the next ten to fifteen years will be crucial for India and serve as a determination on whether it will be a great developed superpower of the future or if it's destined to fail.